The Tampa Bay Cannons (0-1) challenged the Raleigh Flyers (1-0) for the first three quarters before the home team Flyers pulled away at the end to win 27-22 in their opening night matchup. The Flyers have won five straight against their divisional rivals dating back to 2016. Jacob Fairfax could not be slowed down for Raleigh as he notched eight goals on the night, the second highest single-game total of his career. Mischa Freystaetter scored the opening goal of the contest in his debut with the Flyers - his only goal of the night - while throwing two assists, and reigning MVP Jonathan Nethercutt threw four assists of his own. 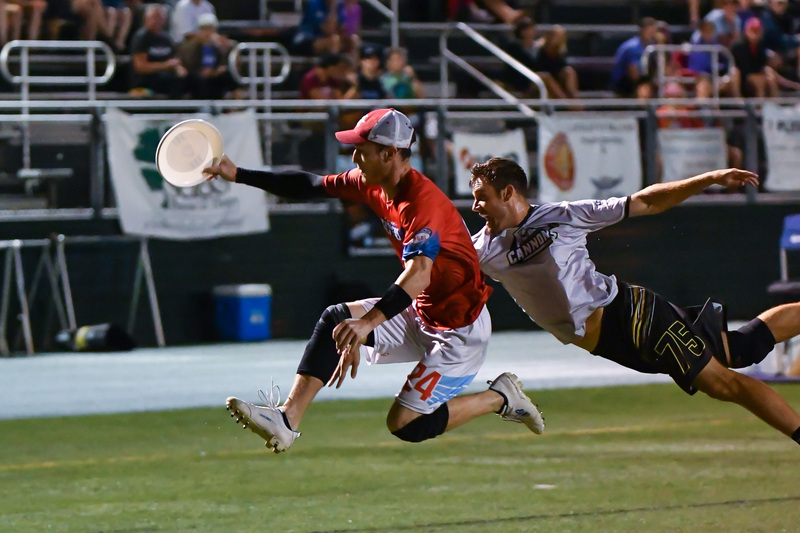 Rookie receiver John Taylor paced the Cannons with eight goals, while 2017 All-AUDL member Bobby Ley threw four assists and newcomer playmaker Nathan Vickroy scored three goals and threw seven assists in his Tampa Bay debut in the loss. The Flyers put a final exclamation point on the evening as Shane Sisco made a terrific speeding grab in the final moments to seal the Flyers first victory of the season. You can watch the full game highlights from the Game of the Week showcase below.